Hey guys. So I've been replaying the first Kingdom Hearts game for like the zillionth time to try and sate my desire for Kingdom Hearts III (with little success), and there's something this game had that no other entry in the series ever brought back: defensive aero magic. Aero magic in the first game was awesome! It greatly reduced defense taken and Aeroga was even able to deflect certain attacks. This made frustrating bosses easier and was a unique use of aero magic that I've never seen in any other video game, not just Kingdom Hearts. I was so disappointed when Kingdom Hearts: Chain of Memories came out and Aero had become an offensive spell, and was further disappointed when Kingdom Hearts II didn't include the spell at all. Then when 358/2 Days (and all the games that followed) had it, it was just another offensive spell. Honestly, it's one of the only legitimate complaints I have about the series' use of magic. Am I the only one who misses the defensive Aero magic from the first Kingdom Hearts? Or do you guys agree with me? Do you think they'll ever bring this back? I uploaded this to my Twitter and few other social media. But I figured I should upload this here. I am working on a dedication project that's in a way related to a countdown. I will play every playable game (including the DS games + their movie counterparts...Union Cross is an acception because the story is not finished yet LOL) then I will draw them out based on that game and this will be monthly. Example: KH1 in June, Chain of Memories (including reverse/rebirth) in July, KH2 in August, etc etc. Starting with, of course, the beginning of the series, simply just Kingdom Hearts. We all remember: inserting the disc to our PlayStation 2, hearing dearly beloved, being blown away by the opening, going through the tutorial starting with out own choices (I know most of us chose the sword LOL), fighting the once terrifying Darkside, exploring Destiny Islands, hanging out as Sora with Riku and Kairi, fighting heartless, getting a Keybalde, meeting with Donald and Goofy, going to many Disney worlds, meeting a few Final Fantasy characters like Cloud, facing difficult bosses, solving puzzles, the final boss, the ending. All of that for the first time was magical. A mix of Disney with the aesthetics of Final Fantasy was what many of us would never dream of would exist. Here we are now with the many games after KH1 getting us prepared for KH3, a revolution we are ready to face. 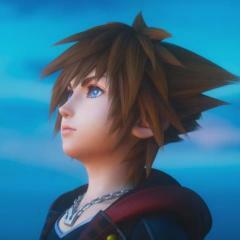 Our story begins with Sora, who lives on an island with his best friends Riku and Kairi. They attempt to build a raft to explore outside worlds. One night, the island is attacked by creatures if darkness, called Heartless, the forcibly separated Sora from his friends. Sora stumbles upon another world, with a strange weapon [the Keyblade] aside him. There in the new world, he stumbles upon Donald and Goofy (who are traveling looking for "the key" in hopes to find their missing King). They all travel together to many different worlds while fighting the heartless in hopes to find their friends. This game was unique and strange but it was a good feeling. There was Disney magic, but this game had it's own magic that a mix of Disney and Final Fantasy. It was a truly magical experience I will never forget. Looking at it years later, the fact that it was possible to remaster the game that is over 15 years old, shows that it has aged well. That being said, the gameplay is a mixed bag and it is heavily subjective. Sora did feel a bit clunky. 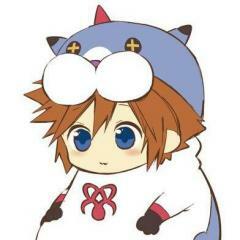 But, I also felt this seemed appropriate for Sora honestly simply because it is the beginning of his massive journey. Of course you'd feel clunky jumping around swinging an oversized key (I'm sure this was not intentional from the developers) LOL. It was alright for me playing the game simply because my nostalgia was stronger than my own critique. There was one thing that bothered me was the editing in transitioning via dialogue. The original had this issue before the final mix. However, I did know that there was one scene when a character made a deal and was offered the thing they were looking for. It took them about 5-6 seconds to respond....in the original it took them 3. Out of all the games, this game had the most awkward editing with dialogue. The titles in the series is a journey in itself to reach to the one game we had waited for for so many years. I hope to entertain you with my thoughts and my artwork for this series. It is thanks to this series that I an doing this. I hope you all enjoy what I offer. This was simply fun to do. I had some struggle trying to pose Sora the way I want him to. The shoes were especially difficult (I am not used to drawing huge shoes LOL). The water was my most favorite to do. The shore bit was something I am extremely proud of.